Katra, August 29 - The annual celebrations of the Navratra Festival at Katra will commence from September 19, 2009 and culminate on September 27, 2009. The festival is being organized by Shri Mata Vaishno Devi Shrine Board (SMVDSB) with assistance from state tourism department, some local organizations of Katra. To discuss the arrangements for the celebration of Navratra Festival-2009, a meeting was held here today by the J&K state administration under the chairmanship of Divisional Commissioner, Jammu, Dr. Pawan Kotwal, who is also chairman of Navratra Celebration Committee, Katra. Additional Chief Executive Officer, SMVDSB, Dr. M. K. Bhandari, District Development Commissioner, Reasi, Mr. P. K. Pole, Director Tourism, Jammu, President Municipal Committee, Katra and senior officers of different departments, members of Navratra Celebration Committee, President Cultural Association, Katra, President Hotel and Restaurant Association, Katra, President Indian Style Wrestling Association, Katra, President All India Devotional Song competition, Katra and other prominent persons connected with the festival were present in the meeting. The nine-day festival is expected to include events like grand inauguration of festival, daily cultural procession, cultural programmes by Song and Drama Division, wrestling competition, religious discourses, All India Devotional Song competition, cultural programme by school children, Hasya Vyang competition, ethnic food festival and exhibition of departmental stalls. The entire Katra town will be given a festive look by Municipal Committee, Katra. Showering of flower petals at the time of inauguration of festival will be one of some other big highlights of the festival. Speaking on the occasion, Dr. Kotwal appreciated the role of people from Katra for their whole hearted initiative and support in making the Navratra Festival a grand success year after year since it became an annual feature in 1996,. He said that the role of government in such events is that of a facilitator but it is only because of large-scale local participation and initiative that lend a festive appeal and grandeur to the festival. Navratra Festival in Katra is an important event at the base camp of the pilgrimage to Shri Mata Vaishno Devi Shrine which is an important destination on the world pilgrim tourism map. 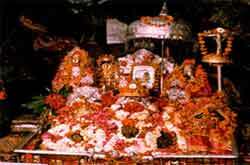 Click here to read more information on Navratra Festival at Katra. Click here to view Photo Gallery of events during Navratra Festival. Navratra Festival - Yatra to the Shrine of Mata Vaishno Deviji undertaken during the Navratras is considered the most auspicious .